Unspecified in Bible narrative. I’ve set this scene in the mid morning. Sunlight (from the left) illuminates this scene. From left to right: centurion Julius, some dock workers, apostle Paul, 2 Roman soldiers. This scene was specially requested by a customer. 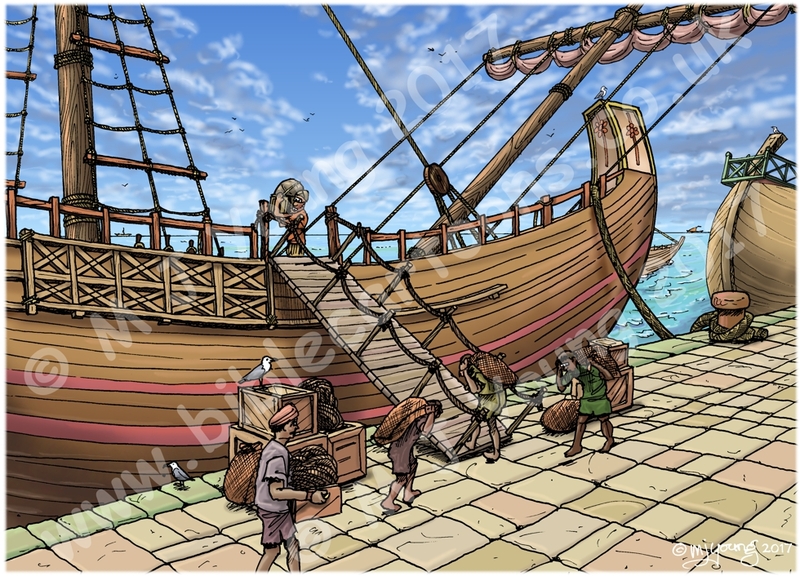 I don’t often get to draw the sea, or ships, ports, etc, so it was great to get the chance to draw this scene. The centurion named Julius is consulting a wax tablet (in his hand) with the names of the prisoners given into his charge. I decided to draw the centurion without his usual medals, highly polished armour, etc, which I suspect he would only wear on special, state occasions. Loading some prisoners bound for Rome wouldn’t really count as one of those! This centurion’s chain mail armour is edged with leather and he carries the short sword that all Roman legionnaires typically possessed. I have drawn the apostle Paul in some other scenes, in which I established his features, clothing, etc, so that I could confidently draw a similar apostle figure and maintain continuity between scenes. Notice there are a few other ships near by, and some more on the horizon. 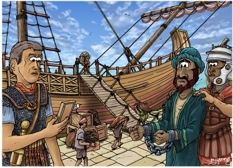 Which sea port was Paul taken too at the start of his voyage to Rome? The apostle Paul passed through Caesarea three times (see Acts 9:30;18:22; 21:8); and it was here he was sent under guard from Jerusalem to escape the Jewish plot to kill him (see Acts 23:23). It was also here that Paul was imprisoned untill his final departure for Rome. Caesarea is an ancient port and administrative city of Palestine, on the Mediterranean coast of present-day Israel, south of Haifa and north of Joppa/Jaffa. It is often called Caesarea Palaestinae, or Caesarea Maritima, to distinguish it from Caesarea Philippi, which is near the headwaters of the Jordan River. Originally the port was an ancient Phoenician settlement known as Straton’s (Strato’s) Tower. It was rebuilt and enlarged by Herod the Great, king of Judaea, under the Romans, in 22–10 BC. It was renamed for Herod the Great’s patron, the emperor Caesar Augustus. It served as a port for Herod’s newly built city at Sebaste (Greek: Augusta), the ancient Samaria of central Palestine. A roman aqueduct (still visible today) brought water from springs located almost 10 miles (16 km) to the northeast. Caesarea had an artificial harbour made of large concrete blocks and typical Hellenistic-Roman public buildings. 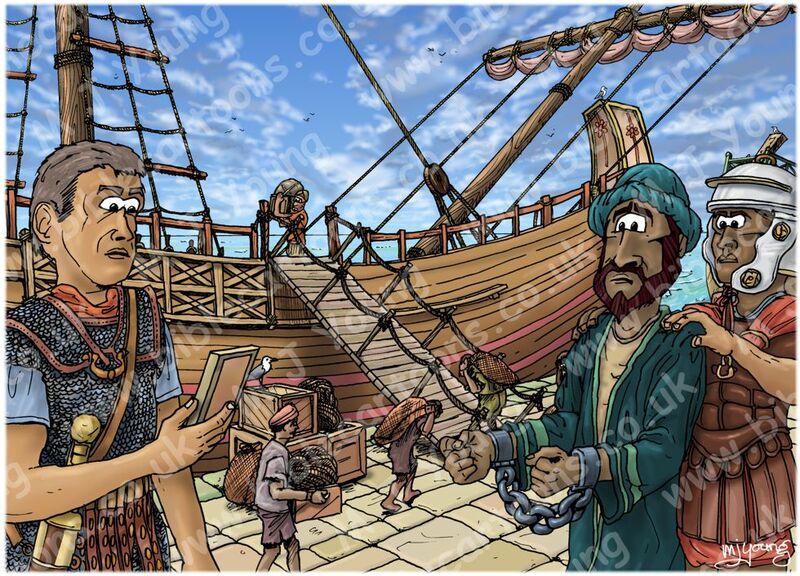 Caesarea served as a base for the Herodian navy, which operated in aid of the Romans as far as the Black Sea.